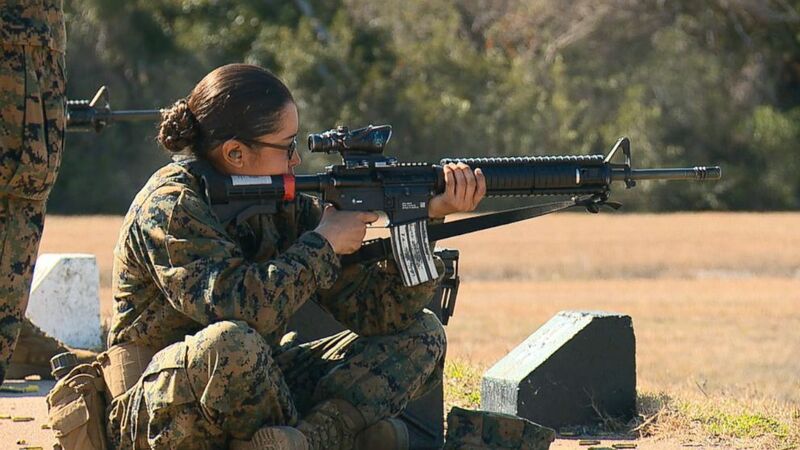 "The value of increasing the amount of integration that occurs between male and female recruits is that with increased exposure and socialization we address some of the attitudes that male recruits might have about female recruits and vice versa," Lt. Col. Misty Posey, who leads the 4th Battalion, told ABC News during that visit. Male and female recruits complete the Combat Fitness Test exercises together: running side by side, facing each other while lifting the same 30-pound ammunition can over their heads, and sometimes even carrying one another on their backs. The genders are also integrated during the end of "The Crucible" -- the 54-hour culminating event of training where recruits face physical, mental, and moral challenges with only eight hours of sleep over the three days. They now hike the last nine miles of the event together.